that Fenle passed away quietly with his mate, Crimson Rose by his side. Fenle was such a sweet,happy little guy and we will really miss him. He was one of Rob's favorite little bunnies and they shared a daily bonding ritual. We will Crimson Rose will find a new mate and let you know how she is doing. Goodbye Mr. Fenle. We loved you! Hi! My name is Fenle. I was injured before I arrived at SaveABunny and not able to use my back legs. It is unknown whether I will ever regain use of them, but for now I "scoot" using my front legs. I don't go very far, but that's OK, because my hay and water is right near me. I really LOVE to be talked with and petted. I reach my head way up when someone passes by,just to make sure they stop and spend some quality time with me. I have limited feeling in my back legs, but do not have bladder control, so I need to have my bladder expressed 2-3 times per day and a little help keeping my special, private area clean. I'm an easy-going, appreciative and loving guy, so I try my best to be helpful. The bright spot of my life is my new girlfriend, Crimson Rose! Isn't she GORGEOUS! We came into each other's lives when we both needed a lot of love and healing. Crimson Rose was abandoned by her human because she developed "inconvenient" special needs. What was especially selfish and heartbreaking to do to Crimson Rose is that in addition to her human letting her down, she took away her bonded bunny mate. Thankfully, the people here at SaveABunny understand that the emotional needs of rabbits care are as important as the physical ones. Though initially in shock over being dumped by her person and losing her home and mate, Crimson Rose got lots of healing and a new friend--me! Now we love, snuggle and groom each other. Her special needs are not as significant as mine. She has some minor mobility issues because of a congenital issue in her knees. She also has a sensitive tummy and so greens are a no-no. She can use a litter box (I can't), but occasionally she needs to be "freshened up down there." 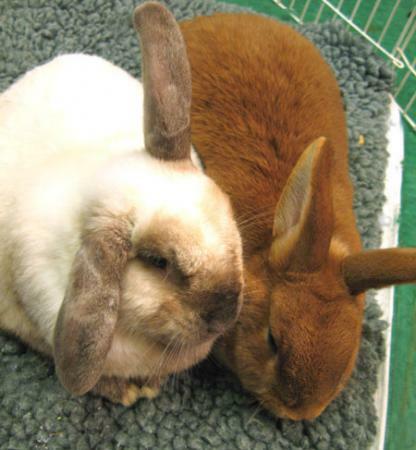 Anyone who adopts us will be blessed with two very grateful and good-looking bunnies. We require extra care, someone who doesn't mind some poo and pee and an experienced bunny guardian. We love each other and must be adopted together. You'll see....we will return your love and devotion ten times over!